by William Audley Maxwell. Although this is a recollection and the information has certainly been colored somewhat by the passage of time, the memories seem clear enough to give an image of his travels. The very beginning of his book starts to dent some of the Hollywood mystique about emigrant trains. In his train are 37 persons in eight wagons -- not exactly the long column that is so photogenic for the movies. His accounts recount the experiences of someone encountering the landscape of the West and all it contained for the first time. 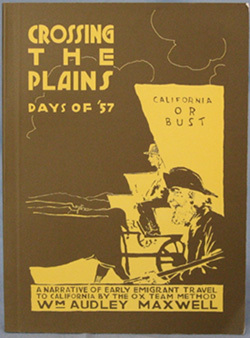 It is an excellent source of information about how the early emigrants viewed the vast territory of the Rocky Mountain west that is crossed so easily now on interstate highways. If a negative comment could be made, the author does discuss disproportionately the real or threatened Indian attacks, including one assisted by some white settlers. In this latter attack, one of the settlers was captured, tried, and executed by the emigrants. Whether his discussion of the savageness of the Indian attacks was to provide a justification for the settlers treatment of the Indians we can only guess. But that discussion, too, yields clues about the attitudes of the people of the time concerning the Indians.